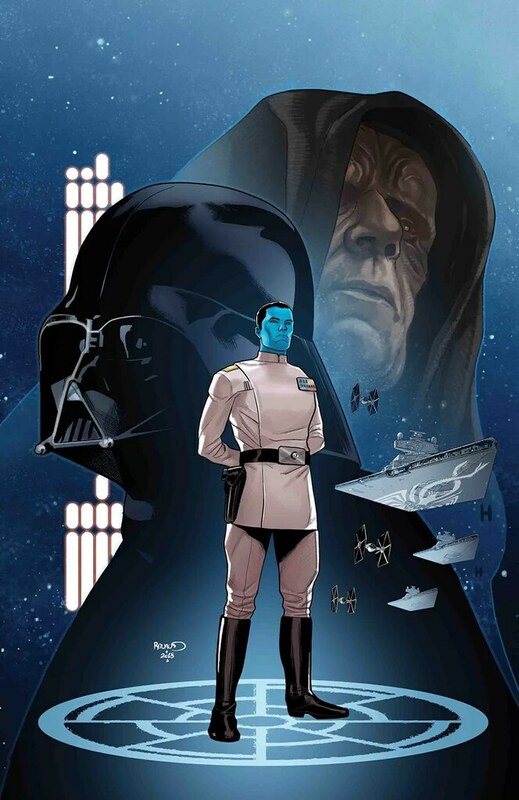 Thrawn #6 wraps up the comic adaptation of Timothy Zahn’s novel. It does a good job of capturing the story and the characters, and the artwork isn’t too bad. While it doesn’t really offering anything new, it is a quicker way to digest the story than having to read the whole book. The issue opens with the meeting of Thrawn and Nightswan. As one would expect, it’s a wordy encounter as they talk and trade barbs. Eventually we see Pryce’s storyline play out as she gets her parents off planet and sacrifices everyone else to hide the mess she leaves behind. She maneuvers herself into an alliance with Thrawn, and diverts his attention to Lothal, neatly tying in with the Star Wars Rebels animated show. The issue ends with Thrawn confronting Palpatine about the Death Star, and Eli Vanto joining the Chiss. In the end, this comic adaptation offers a quick way for fans to consume the Thrawn story without having to read the novel. There’s nothing extra aside from the visuals. Jody Houser does a good job of pairing the story down to its essential elements in order to fit it into six comic issues. However, if you really want to get the most out of the story, the book is always going to be the way to go. Luke Ross did a decent job with the artwork, but his style is quite different from what you usually see in comics. It’s not glossy and pretty, but drab and gritty. There’s some good artwork in there, both characters and ships, and even environments. But the heavy use of shading lines can be distracting. When combined with Nolan Woodard’s subdued colors, it gives the comic an older, vintage look, for better or worse. It’s not my favorite artwork, but I didn’t dislike it. Sometimes it worked better than others. On its own, I give Thrawn #6 a three out of five metal bikinis. It’s a good adaptation, but it doesn’t offer a lot to make it a must buy comic. That pretty much sums up the entire adaptation. For people who prefer comics over books, then this adaptation would be the way to go, but there’s not a lot of reason for book lovers to make the opposite jump.